An ocean of hot tea, plates of itty-bitty sandwiches, sugar cookies shaped like teapots, and sorbet eaten with doll-sized spoons, plus books–what’s not to like? 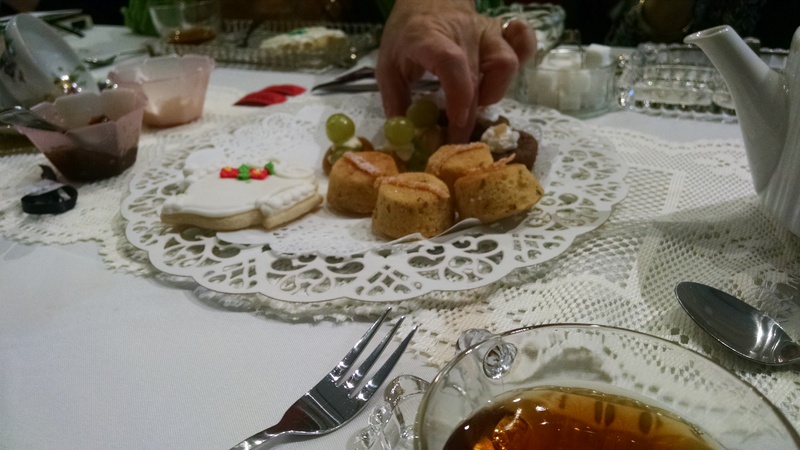 Saturday I was one of the guest authors at the annual Samaritan House tea in Newport Oregon. 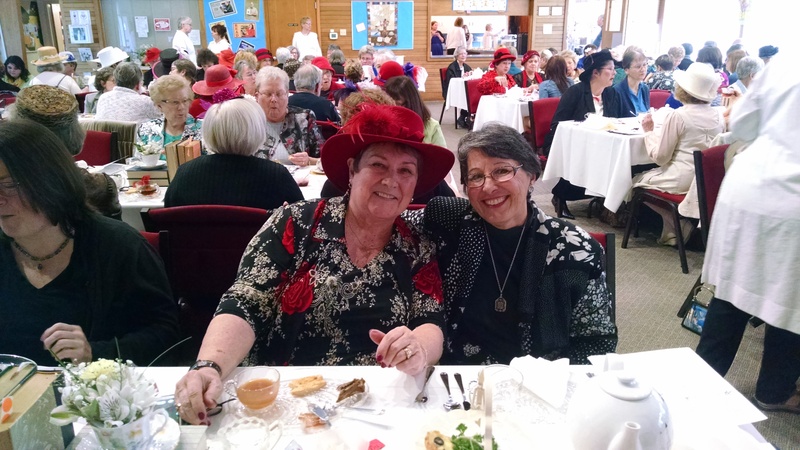 The tea raises funds to support our local homeless shelter. The ladies who organize it go all out, and it shows. The tables and walls were decorated with books and antique tea cups. The programs, thick with ribbons and more teacup images, included recipes and bookmarks to use on our next reading adventures. The beautifully crafted treats included cucumber sandwiches, scones with clotted cream and jam, orange lavender polenta cakes, black olive and rainbow chard bars, and little teapot figures created with green grapes and frosting. Held at First Presbyterian Church, the tea sells out early every year. Middle-aged and old ladies and young moms bringing their little girls jam the fellowship hall. They doll up in flouncy dresses and big hats decorated with feathers, flowers, and lace. It’s a scene right out of Great Gatsby–if it was cast with our friends and neighbors. The atmosphere is loud, giddy with too much sugar and caffeine, and generous. In addition to the tickets, the tea-goers bid on a silent auction, buy the books and teacups decorating their tables, and donate cash to the cause. The theme varies. This year as part of “Tea and Tomes,” six authors were invited to display and sell their books and give brief talks about their work. We shared a table and swapped stories from our publishing adventures. It was fun getting to know each other and showing off our books. Besides me, the authors included: M.C. Arvanitis, author of middle grade and young adult fiction; Patsy Brookshire, author of the novels Threads and Scandal at the Willamina Quilt Show; Deborah Lincoln, author of the historical novel Agnes Canon’s War; Deborah H. Trusty, author of The Kid from Valsetz, a biography of former Newport city manager Don Davis; and Karleene Morrow, who wrote a novel titled Destiny and How to Write a Novel. Morrow passed away recently, but her friends brought her books and told her story. Many of the people at the tea knew me only as the girl behind the piano at Sacred Heart Church, which was where I had to go right after the tea, to play for the 5:30 Mass. They were surprised to see how many books I have published. I had five at the table, Childless by Marriage, Shoes Full of Sand, Stories Grandma Never Told, Azorean Dreams, and Freelancing for Newspapers. Info on all of them at http://www.suelick.com/Products.html. For those who think I’m amazingly talented, I tripped over the microphone cord after my talk. I also dropped one of my little sandwiches face down on the carpet. Nobody’s perfect. The photo above shows me on the right and my friend Pat Stern in her fancy hat. Have a cup of tea and read a book. It feels good.